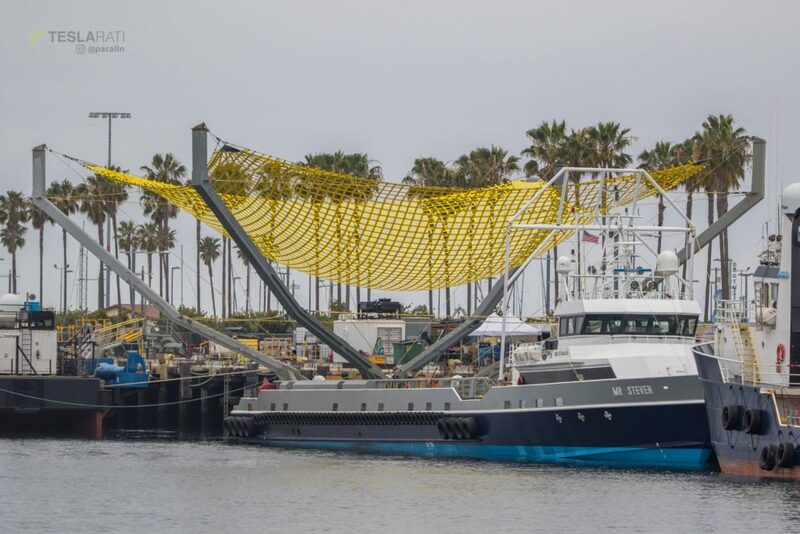 While photographer Pauline Acalin just barely missed a toasty Cargo Dragon returning to roost earlier that morning, a routine checkup on SpaceX’s Port of Los Angeles facilities revealed a hefty new net installed on the recovery boat Mr. Steven, as well as noteworthy activity at the huge tent currently harboring the rocket company’s BFR tooling. After completing a thrillingly routine International Space Station resupply mission (SpaceX’s fourteenth) and spending a month on orbit, the commercial spacecraft reentered Earth’s atmosphere at a respectable 7.5 km/s before splashing down in the Pacific Ocean for the second time. Currently, SpaceX’s Dragon capsule is the only operational spacecraft capable of returning an appreciable amount of cargo from the ISS, and Capsule 110 (1 referring to Dragon 1, 10 referring to the tenth integrated spacecraft) returned even more cargo (nearly 2 mT) than it delivered to the ISS, including the space robot Robonaut 2, various completed experiments, and expired hardware. As of CRS-12, SpaceX has effectively ended production of new Cargo Dragon capsules, and has since flown two additional missions using refurbished capsules, perhaps paving the way for the first-ever triple reuse of an orbital commercial spacecraft. CRS-15, Dragon’s next flight, is currently scheduled for early July. Although Pauline missed the battle-scarred capsule’s second return to Port of San Pedro, her travels were not for naught. Berthed at SpaceX’s leased dock space, SpaceX recovery technicians appeared to have installed and rigged a brand new net aboard fairing recovery vessel Mr. Steven in the several days between her visits. 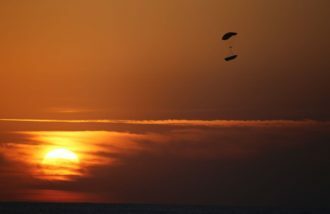 While he has yet to catch a fairing out of the sky (the ultimate goal of the program), the vessel has returned to land two of three largely intact fairing halves, the only payload fairings to have ever been recovered in one piece after an operational rocket launch. 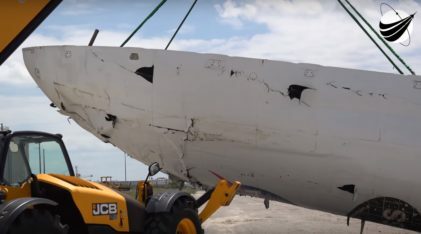 The first successful recovery followed PAZ, and although – per sources familiar with the matter – that particular half experienced catastrophic cracking while being hoisted from the ocean onto Mr. Steven’s deck, it appears that the second intact half (following Iridium-5) did not meet the same fate. It’s probable that – assuming Musk does mean to conduct helicopter drop tests – the structurally-intact Iridium-5 half is thus a prime candidate for air drop tests to perfect the system’s accuracy, as fairings immersed in saltwater are not candidates for operational reuse. 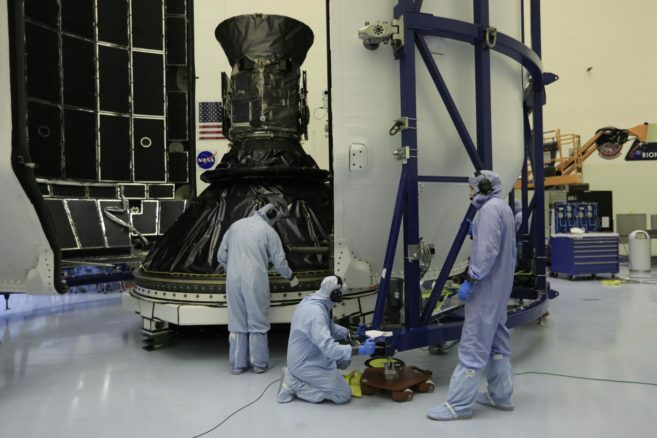 Meanwhile, several thousand miles to the East, SpaceX nailed their first intact recovery of a fairing half in the Atlantic following the historic and successful launch of NASA’s TESS, an exoplanet observatory that will more than fill the boots soon to be left empty by forlorn Kepler. 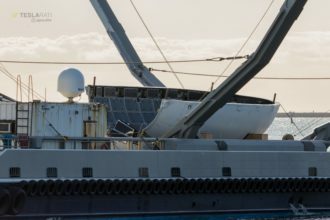 Likely to discover thousands upon thousands more planets orbiting other stars, it is perhaps fitting that the mission also featured a successful Falcon 9 booster recovery and the first-ever (more or less…) intact recovery of both halves of a payload fairing. One half was absolutely shredded, but USLaunchReport reported that the half not caught on video was in comparatively perfect condition. 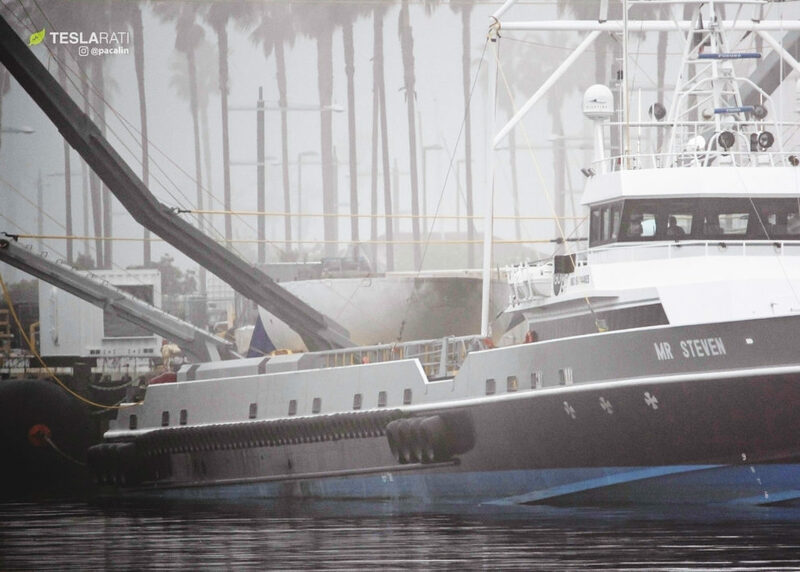 Returning to Mr. Steven’s visibly-upgraded catcher’s mitt, the newly-installed net is by all appearances magnitudes larger, heavier, and stronger than the minimal mesh specimen it is clearly replacing. 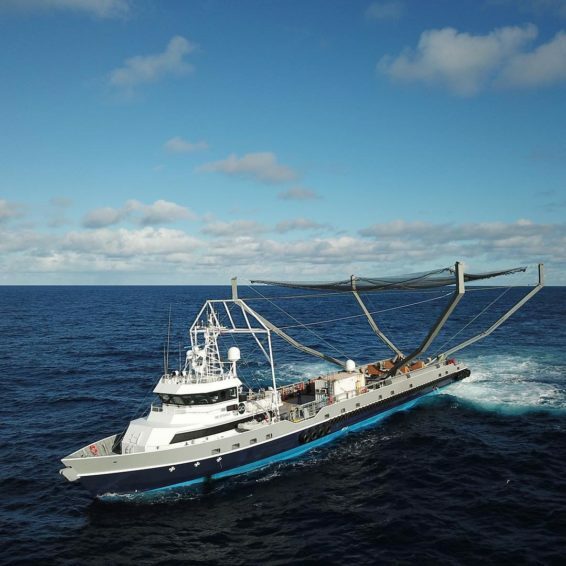 Given the fact that SpaceX thus far has self-admittedly failed to catch a gliding fairing half in the net, it seems unlikely that such a drastic upgrade would be necessitated by any field-testing that occurred since Mr. Steven’s debut late last year. 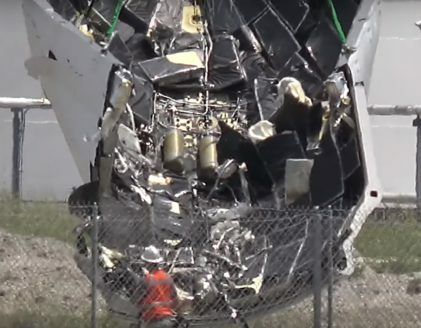 Rather, a significantly more capable net seems to more readily fit alongside CEO Elon Musk’s tweet reveal three weeks prior that SpaceX would attempt to close the final major loop of Falcon reusability by recovering the orbital upper stage (S2). Estimated to weigh approximately 4000 kilograms empty, the upper stage is a minimum of four times heavier than Falcon 9’s payload fairing halves, Mr Steven’s current meal of choice. Judging from the new net’s beefy rigging, broader bars, and general appearance, one could safely argue that it looks at least several times stronger than the mesh net before it. One could also argue that the absolutely massive metal arms installed on Mr. Steven are far larger than what might be required to catch the extremely low mass-to-area ratio payload fairings, with structural heft and bulky netting more reminiscent of safety nets present on naval vessels that are designed to catch aircraft and helicopters weighing five metric tons or more. Currently scheduled to liftoff around 4:12 p.m. EST May 10 from SpaceX’s LC-39A Florida launch pad, the company’s next mission will send Bangladesh’s first communications satellite – Bangabandhu-1 – to a geostationary transfer orbit. Equally significant, it will hopefully become the successful inaugural flight of Falcon 9 Block 5, a highly reliable and reusable collection of upgrades to the workhorse SpaceX rocket. Soon after, SpaceX will likely aim to complete two additional launches in late May, one from California’s Vandenberg Air Force Base (Iridium-6/GRACE-FO) and the other from LC-40 in Cape Canaveral (SES-12). While the latter two launches – per their flight-proven boosters – will be expended, the first Block 5 booster (B1046) will attempt to land aboard drone ship Of Course I Still Love You, already on station in the Atlantic.